Warehouses are an integral part of the AmeriCommerce online stores system. It is mandatory that there is a default warehouse. This is used to determine the origin address of your packages. 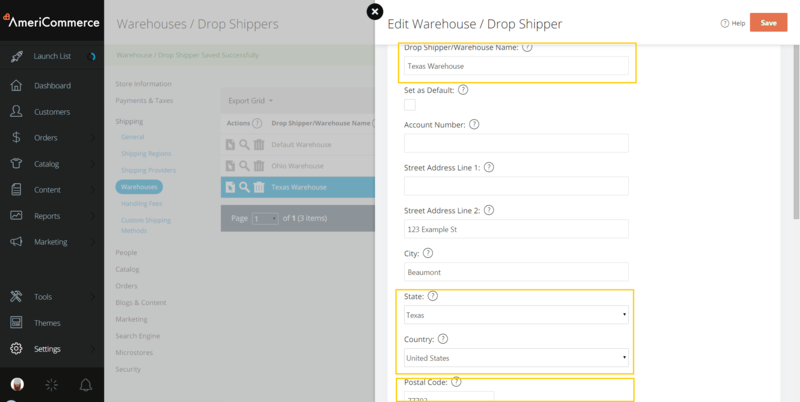 If you ship from multiple zip codes or from distributors, you can define these origins as Warehouses. This can also be set through the Data Import tool as well. 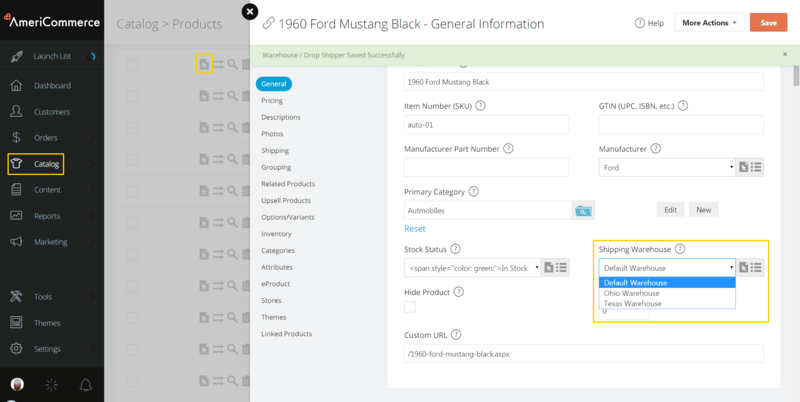 Emails can be sent out to a Warehouse / Dropshipper automatically when an order is placed and payed for. To set this up, first, navigate to Settings > Shipping > Warehouses, and edit a Warehouse. Scroll down the page until you see the “Email Notifications” section. Under New Order Notification and Payment Received Notification the notification should be set to Payment Received (Drop Shipper). This triggers the Payment Received (Drop Shipper). It sends to your designated warehouse every time an order has been created or payment is received for an order. This email is the system default email that includes the pre-defined merge codes you will need. If you wish to use another email to send to your warehouse or simply modify the default Payment Received (Drop Shipper) email, you can make those changes in the Email Template List. To navigate to Email Templates section, go to Marketing > Email Templates. From this section you can choose to edit your existing Payment Received (Drop Shipper) email or create a new email template to send to your customers. If you create a new template, please be sure you have your warehouse set to the correct email notification template covered at the beginning of this article. Set as Default: Sets this drop shipper or warehouse to be the default. If any others are set to default, they will not be after this one is saved. Products that have warehouse set to "Default" will use this warehouse. Email Address: he email address for the drop shipper or warehouse. This must be set in order for the drop shipper to receive email alerts when a new order is placed or when payment is received on an order. Status URL: The URL for the status of the drop shipper or warehouse. New Order Notification: The email template that will be mailed to the drop shipper or warehouse when a new order is placed. To turn this feature off, select "[NONE]" from the drop down list. Payment Received Notification: The email template that will be sent when payment for an order is received. This feature can be disabled by selecting "[NONE]" from the drop down box.